This Young Masters Little Wisdom – curriculum – was designed specifically for Centers For Spiritual Living and children between the ages of 4 and 8. 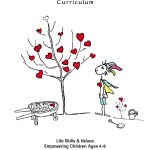 Each lesson and activity of this curriculum is based on the Young Masters Little Wisdom books written by Grammy Award Winner Bunny Hull, founder of DREAM A WORLD EDUCATION, INC. The curriculum has been designed to empower children by teaching Spiritual Principles that connect with a variety of life skills.